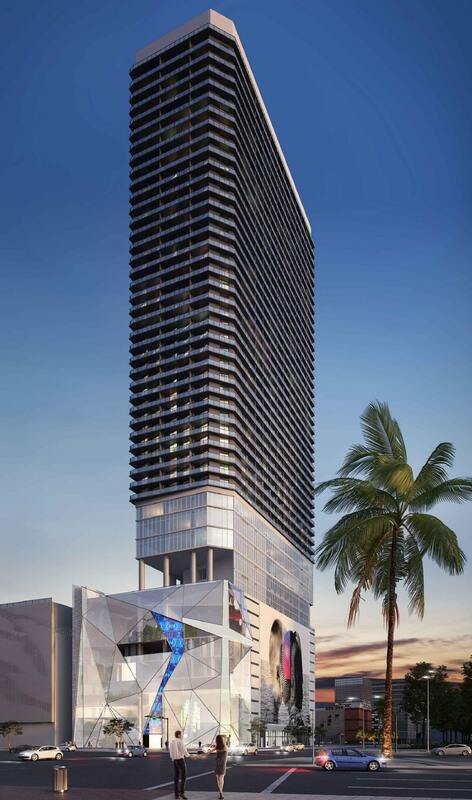 PMG and Greybrook have submitted plans to build a 49-story tower at 400 Biscayne Boulevard, across from Bayside Marketplace. 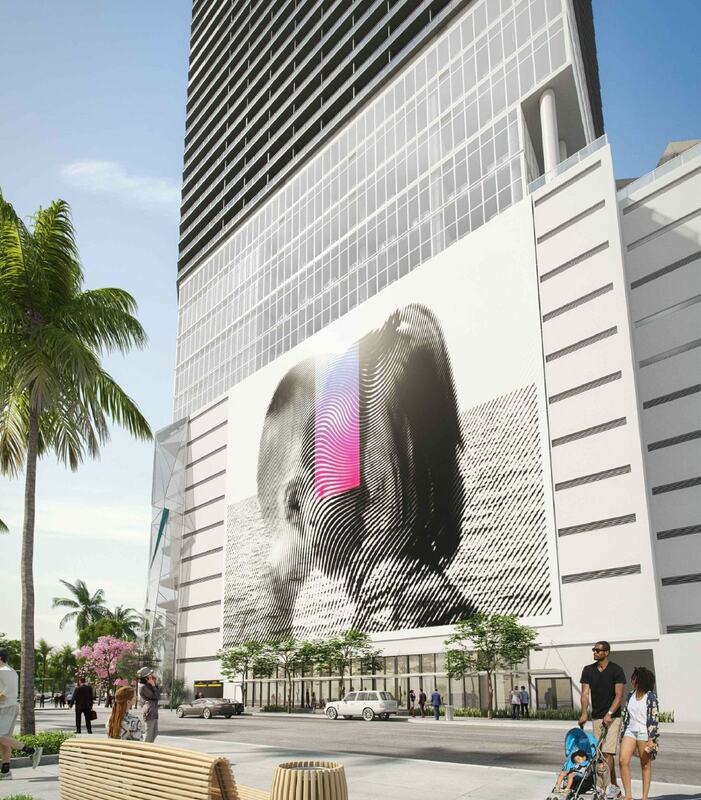 The new proposal is one block away from the recently completed X Miami tower, which was said to already be nearly full, just months after opening. X Miami offers shared living with a rent by the bedroom program, and the new tower appears to be designed for a similar concept. As with 300 Biscayne, a portion of the property is being left vacant for a second tower (A 98-story Waldorf Astoria is planned at 300 Biscayne). For the new tower at 400 Biscayne, gradient white, blue and clear fritted glass will rise 120 feet in the air from Biscayne Boulevard to clad the lower levels. Behind that will be a 12-story church (the First United Methodist Church is getting a new facility on its former land as part of the deal to purchase the property) and a parking garage with 527 spaces. White aluminum louvers and artistic murals will cover the remainder of the garage. An amenity deck for residents is being built on level 9 and 10, including an oversized gym, spa, bar and lounge, and pool and beach areas. Three levels of co-working office space are planned above that. Levels 14 to 47 will be residential, with a total of 646 apartments. More than half of those (340) will be studios, with the remainder 1, 2 and 3 bedrooms. Clear glass with white frames will clad the office levels, while gray glass with dark gray frames and dark gray painted stucco will cover upper residential levels. The roof of the tower will be at 539 feet tall, while the highest point including enclosure will be 573 feet above sea level. 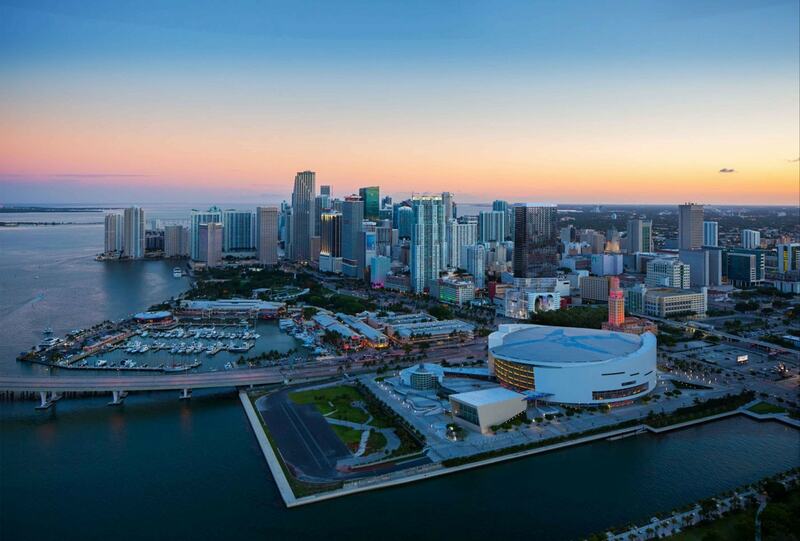 Miami’s Urban Development Review Board is scheduled to review the proposal at a meeting on April 18. Sieger Suarez is the architect. So many things wrong with this design I don’t even know where to begin. Main thing is that front Glass Façade literally cant happen like that in Miami. You cant get pieces of glass that big to meet hurricane code let alone with small frames like that. so that’s an outright lie. Also that blank wall with a “louvered”? art piece. Everyone in the world will see that side of the building because it faces the empty lot. It looks terrible. 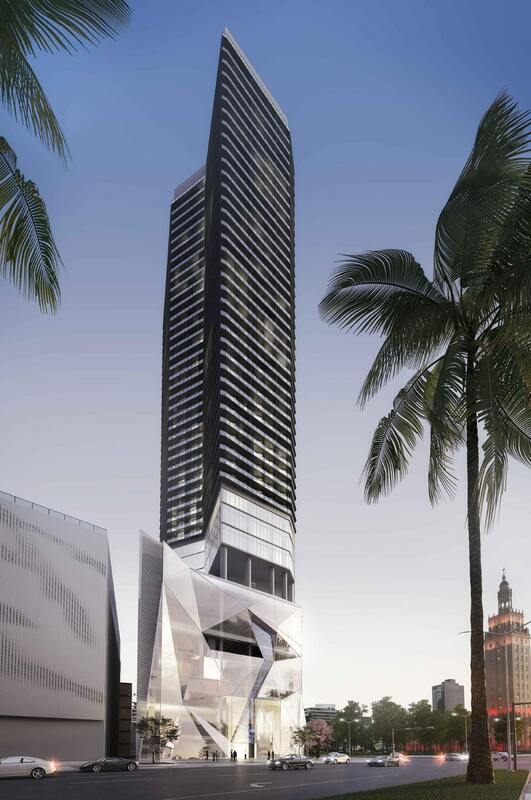 I really hope the Miami design board actually makes useful design critics to address the obvious issues with this tower. glass argument is 100% true, so will probably be smaller pieces of glass. If you look at the document it mentions metal louvers in there. I guessed it meant that the art is on the louvers? It wasn’t very clear. Put really that façade is just a big white wall with a big art piece on top of it. Have you seen Miami X and that huge “canvas” they have hanging on their big grey wall. Looks terrible in my opinion. This just looks like the same thing and much more visible. lol I am an architect. And have worked on some projects that have pushed the limits of what you are allowed to do by code. Which is why I know that the end result will never be able to look like that render in Miami. Pushing boundaries is one thing. Knowing how to create a Boundary pushing design that you can actually deliver is another. It’s not a “render” it’s a “rendering”. I am a glass contractor and that look cannot be achieved under our building code , even with site specific engineering. i liked the original design. I like the tower except for the louvers ::::Looks like part of a dress that Lady Gaga use to wear. The glass argument is irrelevant. Design board does not review for construct ability even if your argument that it wouldn’t work in Miami was valid in the first place. What’s up with the forest across the street? It’s an imaginary forest. I’ll go there on my commute back home hunting for ogres and elves. The tower is horrific. Are these architects designing for retro 1970’s themes? *1980’s and New Wave aesthetic is a trend again. WOW! These comments are RUTHLESS! I really try to understand what everyone likes reading through the comments every week. I have a lot of faith for humanity and I am rooting for us, but these comments are horrible. This structural design is timeless, art on ground level is trendy (Which can be changed at any time) internally, the uses are great. What does everyone want? what is everyone expecting? Some building from a sci-fi movie that defies the laws of physics? This just proves that you CANNOT make everyone happy. We should have a competition of strictly TNM commenters and we all have to sketch and submit how we would like a building in Miami to look. We make a gallery, and then publish all the sketches as an article and we all laugh at ourselves. This is a solid building, let’s move forward. Putting a giant “elephant” doesn’t hide the fact that you’ve got a giant parking garage barely hidden from view from the street. maybe they should put a giant digital Ad display instead? Meh, I don’t like this design at all. Would be a better fit for Wynwood. I actually like the design a lot. It’s different and that’s perfectly fine! WOW! please break ground today. wow that an awful design. I hope you read this thread Sieger Suarez. this will really look nice next to the Waldorf Astoria hotel. Great design and location for another X Miami 2. Certainly an improvement from the last mess, but the glassy feature should wrap around instead of a giant blank wall given the lipstick on a pig treatment with the mural. It would be nice seeing some curves and a crown, too. Also… what are they doing with the other half of the church property? 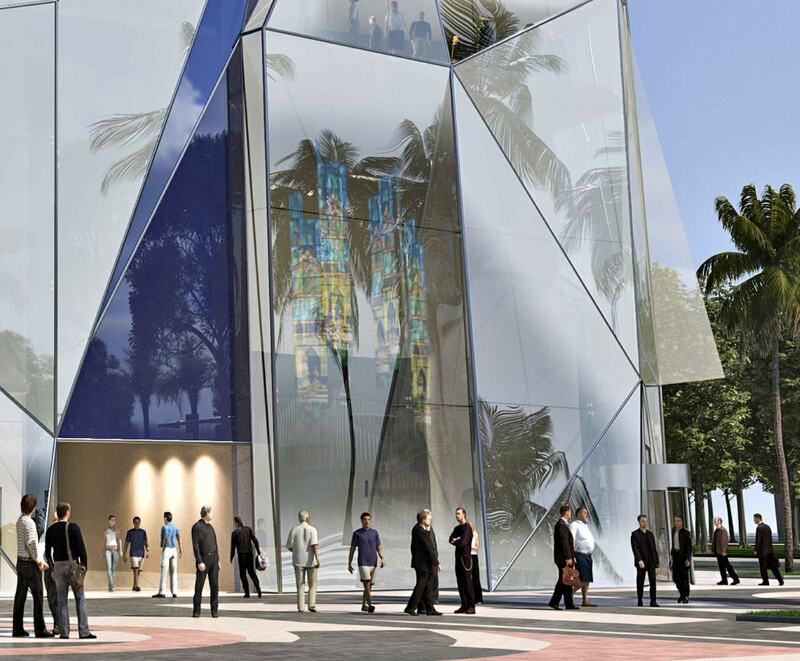 This project only take up half of the churches lot that fronts Biscayne? Anybody else think a 12-story church sounds odd? The base reminds me of the FBI building in Miramar by the FIU I-75 campus. Most of these towers on a pedestal fail at the street level and make for awful urban design. What is this contributing to the Biscayne urban fabric? will cost them a fortune . Cool another edgy cereal box.! Did anyone notice that the original proposal was around 750′ tall ? I am so sick of murals and cheap ways to hide parking structures. Murals, adds, huge painted walls with ‘whimsical’ patterns…they all should be banned as they are poor tryouts to hide ugly structures…why not using real architecture or different material to enhance them? 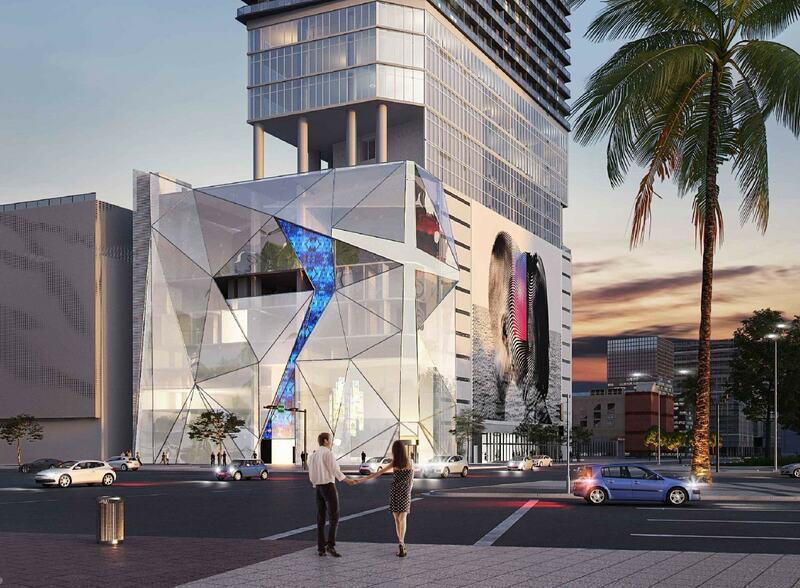 This is downtown not Wynwood and the neighbor building will be the Waldorf not Motel 8 so if they are the same developers building next door, why not integrating both designs to do something cohesive with taste?…and please hire a real architect firm!!! This tower is ugly as hell. The base doesn’t match the office section above, and the office section doesn’t match the residential section above. It’s like you have three towers on top of each other that are not cohesive. 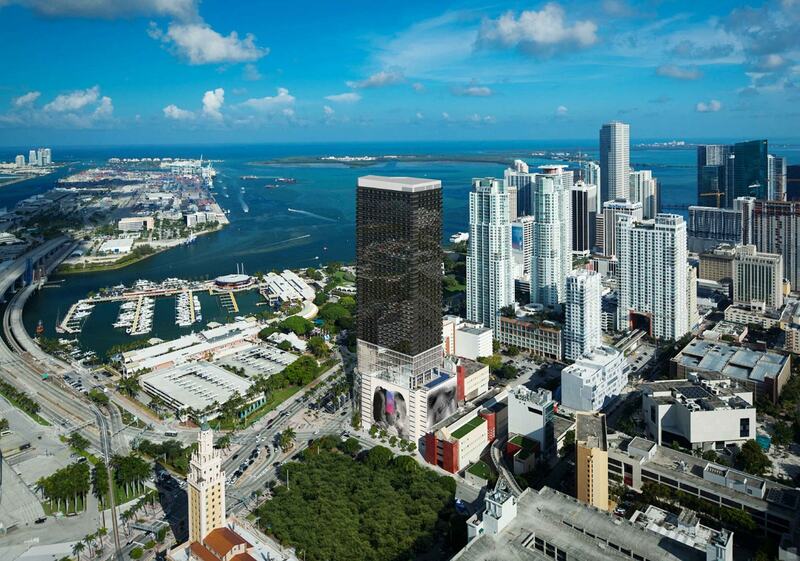 This tower doesn’t deserve the privilege of fronting Biscayne Blvd.! It doesn’t blend with the rest of the downtown buildings. I think it’s a pathetically designed building. With buildings like the Freedom Tower and 1000 Museum to get inspirations this is what they came up with? They’re designing for a budget where much of the space will be studio apts which, in this case, is affordable housing with a view (at least in Miami). The last thing you want is for it to blend with the rest of downtown. We’re tired of square boxes with edgy balconies passing for great architecture.